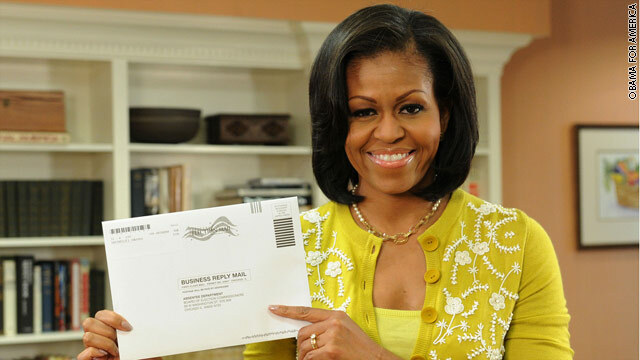 The Obama for America campaign releases a picture of Michelle Obama preparing to mail in her early ballot. WHITE HOUSE (CNN) - First Lady Michelle Obama has officially cast her ballot in the 2012 presidential election. The Obama for America campaign released a photo of her in the White House, preparing to mail her absentee ballot from the state of Illinois. The first lady and president have recently been highlighting states' allowances for early voting and absentee ballots. Voting in her native Illinois began on September 27th. In battleground states, such as Colorado and Nevada, absentee voting begins this week. Virginia voters have been able to cast ballots since September 22nd. The campaign also announced President Obama will vote early in Chicago next week. Now she will cast a ballot in Florida, DC, Chicago and Hawaii. You wish. All that Malarkey about voter fraud is just voter suppression, plain and simple. Let me guess, ACORN was a law abiding organization with high integrity, right? WHy would anyone have issues with showing an ID at the polls in order to vote? You can say all you want there is no voter fraud anywhere and it has never happened, but you would be wrong. If people would be required to show ID there would be no question. Maybe you could better spend your energy on writing something about the military folks overseas not getting ballots in time to cast their votes? CHANGING THE RULES FOR ROMNEY IS WHAT IT IS. THE PENNSYLVANIA COURT IS CORRECT, YOU CAN HAVE YOUR VOTER ID LAW IF YOU CAN PROVE IT WILL NOT INCONVENIENCE VOTERS IN TIME FOR THE PRESIDENTIAL ELECTION. OF COURSE, THEY COULD NOT SO THERE GOES THAT PLAN. SORRY CANDIDATE ROMNEY, I GUESS VOTER ID TO MAKE YOU WIN PENNSYLVANIA IS NOT 'DONE'. Obama never takes responsibility for his actions ... instead, he constatntly blames others ... he throws others under the bus ... has others take the blame for him ... uses Executive Privilege ... blames syntax ... acts indignant ... avoids the issue ... refuses to answer ... has the biased mainstream media, or his devout obama stooges, circle the wagons, or cover his tracks .... or he just resorts to outright lying ... anything to avoid taking responsibility. It's time to replace this poor excuse for a President, with a man of integrity, honesty, and character ... someone with the actual experience and know how to repair all of the damage Obama has caused over the past 4 years ... Mitt Romney 2012 !!! Gee I hope my hubby does not find out that I voted for Mitt, he is so dreamy. If she votes in Florida she'd better remove hanging chads because all those Obama votes will go directly to Mitt. How about Florida Republican's – Strategic Allied Consulting? The Republican Party fired a voter registration contractor this week after the firm turned in illegible, incorrect, and falsified voter registration forms to Florida election officials. Obama and his administration are allowing all of thiese fraudulant things to happen. Anyway why is she using her disability check to lease a car? Why is this allowed? America is really going to get broke soon if these kind of things keep happening. That is why Romney and Ryan will put a stop to it so these people better get ready to start looking for work. That story pure is fiction, but nice try anyway. I work for SSI and there is no way that woman could draw more disability than what she was earning. It's closer to half of that. Either she lied to get a new car or you and your friend lied to score points. And we can continue adding names to that list of lazy uneducated fools; ask Obama. Another effort by the school of Howard's myth-based writing course, with the New Boston teapotty website as his source. Basically this myth has been called pure B S on more than one site. All Howard does is regurgitate viral email hoaxes and other ultra-right wing myths as if they are fact. Another effort from the Howard myth based school of journalism...with the aid of the New Boston Tea Potty website. Howard spends his days posting viral email hoaxes as if they are reality, and other myths which hve been proclaimed for what they really are pure B S.
I agree with you. We may see another Michelle casting her vote somewhere else. You never know!!!!! AFTER GORGING THEMSELVES AT THE PUBLIC TROUGH ... I'M SURE THE OBAMA'S HAVE ESTABLISHED NUMEROUS GOLDEN PARACHUTES ... SO THEY CAN CONTINUE THEIR LIVES OF OPULENCE, AT THE COST OF TAX PAYERS, EVEN AFTER THEY ARE KICKED OUT OF THE WHITE HOUSE. Oh Yeah! I wonder (REALLY. )who she voted for and did she have to nudge her mother to do the same or she will kick her out of OUR house!! Yea! I voted today alone with my daughter and granny. That's 3 more in hopes to keep moving forward with gaining jobs instead of losing them like it was when obama came into....all politics aside that matters to me and my family! WHY WOULD ANYBODY WANT TO VOTE BEFORE WATCHING ALL 3 PRESIDENTIAL DEBATES ??? Why is this news? It's obvious who's shes voting for, but like they say in Chicago, "Vote early and vote often". Probably going to be away on one of her taxpayer vacations. · Contributions Received From All 50 States And Washington, D.C. I posted this just for Lionel. Gee, what a surprise – she voted for the community, organizer !! If she had any foresight she would have voted for the smarter candidate – Governor Romney !!! Stupid...that is definitely NOT news!!! Serious question, what is to prevent someone from mailing in an absentee vote for someone else? Why are Liberals OK with the fact that you have to have an ID to obtain food stamps. Is this not keeping people from receiving services? Lefties don't think, they simply follow what their overseers tell them what to do. If Obama says such and such is good or such and such is bad they accept it without question. Contradictions, illogic and known falsehoods mean nothing to them. Just the other day Obama said "Every life is special" yet at the same time he wants abortion at any time in the term (in Illinois he sponsored a bill supporting infanticide) and lefties see nothing wrong with this at all. The worst thing is he wants taxpayers to foot the bill. Obama's words are bedrock gospel to lefties and he is their god, you simply can't convince them otherwise. Voter suppression is not an offering of the liberals. This season it is only pressed by the conservatives. how is that a waste???? American spent 1T to Iraq war, think of how many PHOTO ID that will pay for all American citizens, residents the like. With all the spending suing and being suing for PHOTO ID, why won't the Government, state, county. city private and corporation all chip in to do up a nation wide PHOTO social security card, with security chips. That is the end of squabble. This is not a red thing or blue thing. Do it American way. Obama has spent $6 trillion in the past 3.5 years. That is $18,000 per person. $72,000 for a family of 4. Imagine what you personally could have done with that money. Start a biz, pay for education, pay off your home. Invest and create jobs. BTW, both the Iraq and Afghanistan war cost about $1 trillion total. Obama has spent more on Afghanistan than Bush did on Iraq. Many, many more people have died in Afghanistan under Obama. well barry/barack got one vote, and I'm sure more from chicago to follow. He is losing voters everywhere, we don't see those obama yard and bumper signs like we did in 2008...people have had an awakening. The obama experiment is over. Weird, I live in TX (way red) and I've seen more Obama bumper stickers and yard signs that I have Romney... I've actually only see one Romney yard sign, and no Romney bumper stickers. Do you think you're grasping slightly? we have three people with ALL democrat yard signs in their yards...and no Romney signs. Conservatives don't broadcast their voting...as a rule...never have. Vote early or just vote. I see plenty of lawn signs jerry. You must live in a red area. Or get your info from fox. People still don't get the voter fraud stuff. There is none. Look at statistics. Lots of elderly don't have photo ID so does that mean they can't vote?? Let's ask everyone – are political signs around where you live? no Joe...this is Washington State...a blue state. The fact is yes there are obama signs but about 90$ less than we saw in 2008. And, the conversations in restaurants and etc. are pro Romney. Anyone that doesn't realize how easy it is to vote lots of times is really unaware of how easy it is. I know I would be able to vote 6 different times under 6 different names as I know those six people are not going to vote themselves. And they live in a state that does not have voter i.d. laws so it's would be a truly easy thing to do. Maybe I will try it. Bet I get away with it. And no one seems to think it's a big deal, why not go for it? And just so you know, I won't be voting for Obama. Six votes for Romney. Yipee. No crap Chicago! Your SON is coming home enxt week to vote!! KEEP HIM HOME;which includes his mother in law. I wonder how mz obama felt when she watched her husband lying through his big teeth? Oh wait, that is what they do in chicago..the murder capital of the world. Unless she's voting for Romney this is not news. CNN have you realyl sunk to NBC standards of below tabloid status? Obviously, she didn't base her vote on the debates. Well, at least Obama gets 1 vote. Reblogged this on Grand Outlet. Rumor has it That Michelle voted for Romney because she wants jobs created for her children and less debt for them to be responsible for in the near future. However, I heard she will miss all our tax dollars to pay for her numerous outfits, vacations, and parties. And this is a FACT! who cares about mz obama voting...this is no news...and by the way you can put lip stick on a chicago pig but it is still a chicago clapping pig! Michelle O looks like a baboon I saw in the Memphis Zoo in 1982. Hey....how come Obama refuses to answer questions about his intent to form a civilian militia. He has made the speech a dozen or so times and no media people talk about it. You know who the last person was to form his own civilian militia? Yep....I'll give you a hint.....he was a short guy from Germany with a little ugly mustache. Obama is losing in the latest Pennsylvania polls. Need more poll watchers to make sure that the black panthers don't get away with what they did last election. Standing in front of polls with clubs making racist statements toward whites. Congratulations : My First Lady you are wonderful and excellent ¡WOMAN!. GOD BLESS YOU AND Dear SIR PRESIDENT and Your Dear Gils, your Mother and everybody inyour Family. Bless. Cecilia Riveros B.